Spend your days hiking, swimming and exploring, and your nights under the southern stars on your four-day camping tour in Australia's spectacular Red Centre. 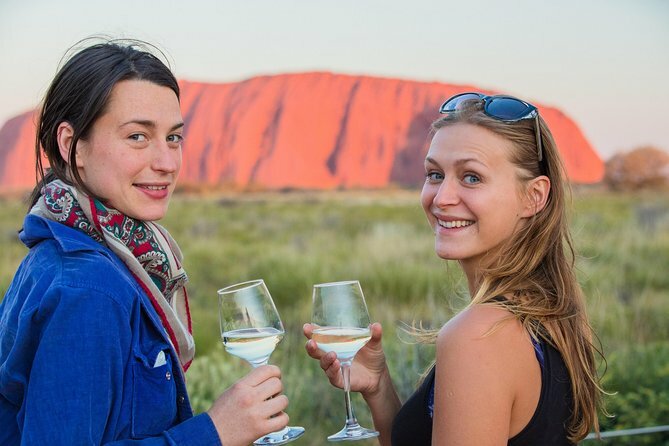 After pickup in Alice Springs or Ayers Rock (Uluru), travel to UNESCO World Heritage-listed sites including Uluru (Ayers Rock), Kata Tjuta (the Olgas), Kings Canyon and the West MacDonnell Ranges. Learn about Aboriginal culture, take guided hikes in the Outback, look for wildlife and swim in natural rock pools. Your experienced guide shares fascinating stories about the places you visit and assists with any questions throughout the trip. Sleep in your choice of a swag (a compact bedroll with mattress and bedding) or in one of the campsite's permanent tents and share meals around the campfire at night. All meals are included, along with camping gear, drinking water, transportation by 4WD, and hotel pickup and drop-off. From day to day the trip is getting better and better. The guide was really nice and especially the camp next to the kings canyon is a must! This is a camping tour so be prepared to rough it. Our tour guide Karla did a wonderful job with a huge amount of responsibility looking after 21 people, driving the 4WD, cooking meals and visiting all the sights that was promised. There is a lot a hiking involved mostly over uneven surfaces and steep canyons Kings canyon, Ormiston gorge. Watching the sunset at Uluru Ayres Rock sipping champagne with crackers and dip was really special. The shower and toilet facilities ranged from pleasant at Uluru to primitive on the 2nd night on a cattle property with hot water achieved by collecting firewood and no shower curtain. Be prepared to have to collect firewood and endure dusty campsites. The air-conditioner in the bus was not working properly therefore sitting in the back seat in 35 degree temperatures on the way to Uluru was not pleasant at all. This tour is quite an adventure and I would strongly recommend booking into a good hotel with a big, comfortable bed, hot showers and a good restaurant at tour's end. The itinerary was perfect, and our guide was incredible. From the pickup to the drop-off, these folks were friendly and all was comfortable. In terms of going into a hot desert, it's hot! It's a desert! Understand your not in Shangrila. It was accommodating, comfortable, and very educational. We loved the many water holes to swim and cool off. I highly recommend WayOutback as your tourism guides. An excellent outback experience as promised, and all round. The whole experience, not just Uluru, KataTjuuta and Kings Canyon, was beyond expectations. Just returned from last trip of the year before the temperatures really hit tops, and although it was already hot, Joe, our guide made sure the walks were done before the heat cranked up. Wonderful walking, great long drives in the 4wd, wonderful bird life, and the camping experience was truly outback. Our group was mixed in age range but Joe made sure walking and climbing abilities matched the options. A great guide. heaven swimming in the gorges and just gradually coming back down to earth. This is a truly magical experience on a number of levels. Fully recommended. Didn't want to leave the Red Desert. It has a way of getting into you. I'd just like more time to absorb it all. What a GREAT trip! If you are visiting Australia dont miss going to the Red Centre! It was an out of this world experience. There are many highlights on this trip the hikes in the areas of Uluru, Kata Tjuta, and Kings Canyon are spectacular. A moderate to good level of fitness will be beneficial for the hikes, but there are many opportunities for less strenuous hikes that . Most days we would hike for three to five hours, have a nice lunch, drive in 4WD style to the next camp site. The drive was enjoyable while we listened to Outback history and stories, looked for animals in the wild horses, camels, dingos, kangaroos, birds, etc. and stopped to forage for firewood. The guide Nat Marshall was outstanding and made Aborigine history and culture, geographical highlights, and Australia history come to life. One of the best parts of the trip for me was camping out in a swag an Australian bedroll under the bedazzling stars. That experience has a way of putting everything in perspective no matter who you are. I also loved the Dutch Oven dinners and eating by the camp fire. You will meet some great people on this tour as well! I hope to have visitors to the USA from Australia, Germany, The Netherlands, and England soon! So much fun sleeping in a swag, under the stars, in the Australian outback! It was an amazing experience to take part of this tour! A must see when you visit Australia. We have seen so many beautiful landschapes. It was like walking trough a postcard. I would recommend this tour. I went to the red centre of Australia at the wrong time right in the middle of summer with sweltering heat and flies getting into every orifice. Despite that, I had a great time and most of it due to the tour. The guide was excellent. He cooked good food despite being in the middle of the outback, drove safely and always on time. The highlight of the trip was that we got to sleep outside underneath the moonlight in our swags. It was a great experience, the best Guide ever had: Deon! The only concern, the sleeping bags - not good enough against the cold nights.